The Baltimore Museum of Industry is one of the best Baltimore wedding ceremony and reception venues with a plentitude of amazing wedding photo opportunities. Located within an old cannery situated along the Baltimore Inner Harbor, the museum is a favorite among Charm City locals looking for a fun and visually stunning place to hold their nuptials. This quintessentially Baltimore locale offers views of the harbor and its sailboats, the Baltimore City downtown skyline, and the Domino Sugars sign as a backdrop. Inside, guests can mingle and peruse the museum’s exhibits highlighting Baltimore’s Industrial revolution and gather underneath a 1937 mini mariner airplane, hanging from the ceiling. The waterside open air pavilion is perfect for a low-key crab feast or an elegant affair. 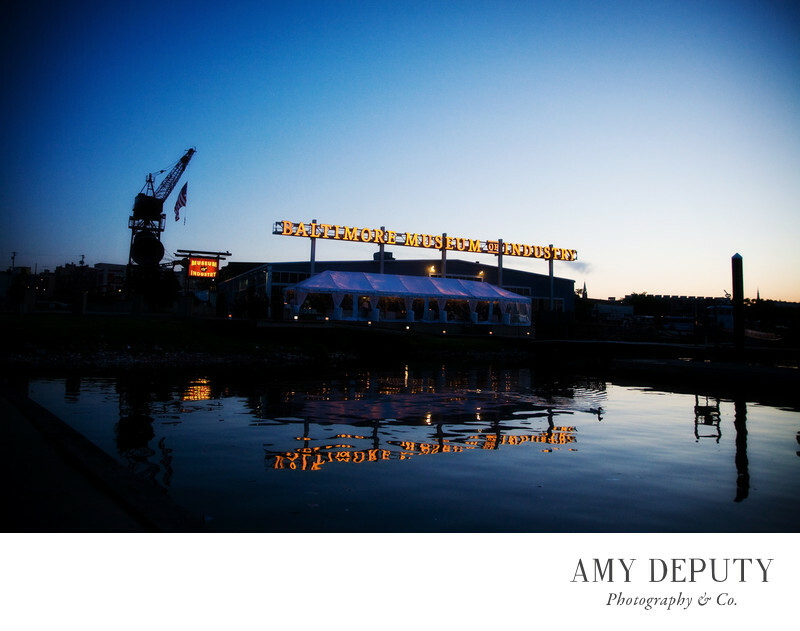 Day or night, The Baltimore Museum of Industry is simply one of the best places for a wedding. Location: Baltimore Museum of Industry: 1415 Key Highway, Baltimore, MD 21230.